If you’re looking to add a four-legged member to your family, why not consider a French Bulldog? These adorable little gremlins are full of character and are definitely lap-warmers and snuggle bugs. If you decide that this is the breed for you, please consider adoption at a French Bulldog rescue! There is some question as to the origin of the French Bulldog, but it’s believed that the toy English bulldog likely played a part, The American Kennel Club (AKC) reports. Toy Bulldogs were all the rage in England in 1860, and imported to France in large numbers. Here, they were crossed with other breeds and earned the name “Boule-dog Francais.” That resulted in dogs with rose-colored ears and dogs with bat ears. Lovers of these cute dogs prize their adorable bat ears. Another characteristic favored by owners and breeders? That almost perfectly square head. The AKC reports that the skull should be flat between the dog’s ears, with a slightly domed forehead. Apartment living. While some small dogs do fine in this environment, others are yappy and high-energy. Frenchies have a calm, quiet demeanor and are polite with other family members. If you can find them, mini French Bulldog rescues may have “teacup” dogs (though they are rare). Anyone who’s never owned a dog. Frenchies are easy to train thanks to their easy-going temperament. They are also resilient and will do just fine, even if you make a mistake. Dogs that are highly sensitive or assertive independent thinkers may be a challenge if you’re a first-time owner. Frenchies are kid-friendly. Known to be gentle with children, these pooches are sturdily built and can take heavy-handed petting and hugging from rambunctious youngsters. And they aren’t bothered by yelling and running kids. Boxers, who look fierce are also patient with kids, as are (surprise!) pit bulls. Chihuahuas are nervous and potentially snappy little dogs and aren’t on this list. Sorry, Chihuahuas! It’s a good idea to keep in mind that all dogs have strong jaws, and no matter how friendly they are, all dogs can bite. Just a gentle reminder. They are easy to groom. With their short fur, Frenchies don’t pose many problems in the grooming department. With a minor amount of brushing and bathing (not more than twice per month), they are the perfect for anyone who prefers no fuss, no muss. And the video below shows you just how easy Frenchies are to bathe. Also known as the Teacup French Bulldog, these little guys are adorable. They are playful, yet have a docile personality, which means they get along well with every pet in your household, including your kids (ha-ha), PuppyToob reports.They are smart little tykes and learn simple commands easily. And they also catch on quick when it comes to housebreaking. Unlike their standard-sized brothers and sisters, mini-French Bulldogs need plenty of exercise, so a daily walk is a good idea. As their name indicates, they are small, standing only 12 inches tall and weighing between 12-18 pounds. Standard-sized French Bulldogs are about one foot tall at the shoulder and weigh 16 to 28 pounds. Would You Like To Find Out About French Bulldog Rescue? Because these are rescue dogs, these Frenchies are likely to have baggage, either emotional or physical. Which means you need to take into consideration what you can handle. You may think rescuing a Frenchie is an inexpensive way to get one. Be assured it’s not. The extra vet bills more than make up for the money you may have saved in rescuing one of these sweet dogs. Rescues often keep detailed biographies of dogs that are up for adoption. Be sure to read the information because it will tell you if the dog is housebroken or if it is good with kids. The biography will also tell you if the pooch is crate-trained and if it has any health issues. Once you have applied, you’ll likely get a call from a foster (someone who has been caring for a Frenchie until it is ready to be adopted), and the rescue network will also call your vet to make sure you care for your pets well. Then the rescue will visit your home to make sure everyone in the family wants to adopt a pet. They will also make sure your home environment is safe for a pooch (no poisonous plants or wide-set railings that a dog can fall through) and other such items. When they complete the home visit, the rescue network will send the application and information from the home visit will be sent to the Board of Directors. They will examine the paperwork and make the decision whether to approve your application. If your application is approved, the network will ask you to sign a contract which states you must return the dog if you are no longer able to care for it. Volunteering: In this case, the rescue network recommends you have training in dealing with flat-faced or brachycephalic breeds (meaning they are likely to have breathing problems). And yes, Frenchies are brachycephalic. 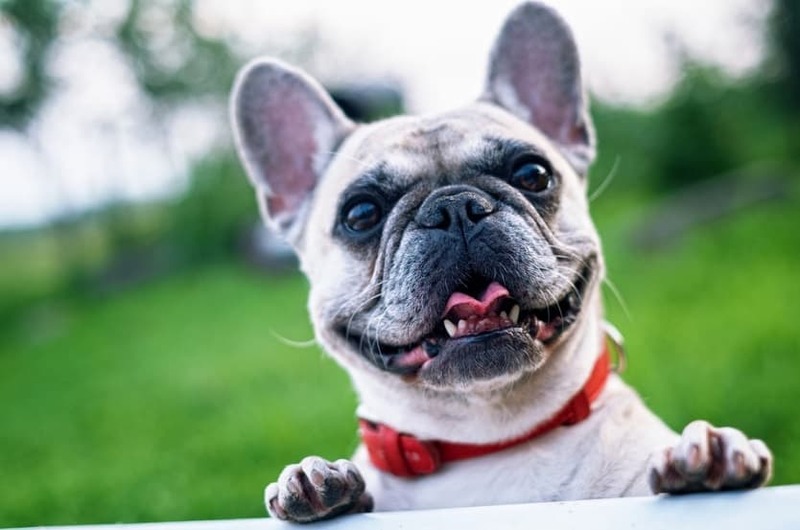 Donating money and goods: The network reports that the number of French Bulldogs coming in is skyrocketing, and many of the dogs are in poor condition. They desperately need dog beds, crates, collars, leads, and toys are in short supply, and in cold areas, coats and sweaters for the pooches. Fostering a Frenchie: FBRN seeks fosters who have experience with French Bulldogs and other flat-faced breeds. Prepare a quiet space for the new pooch, FBRN reports If you have other dogs, it’s crucial that you give your Frenchie a place to unwind, away from the other dogs. French Bulldogs need to have time to familiarize themselves with their new surroundings — the sights, smells, and surroundings of their new home before they you introduce them to the other dogs. It’s best to introduce your dogs when they are outside, rather than inside the house. This way, they are on neutral grounds. Place everyone on a leash and start them on a walk. FBRN recommends that you keep the dogs walking, with no direct contact. At this time, if the dogs seem relaxed, it’s okay to let them greet each other, but if there’s any tension, resume walking. This kind of behavior isn’t unusual. It can take dogs several weeks to get used to each other. When your new French Bulldog is ready to interact with the other dogs inside your home, keep him on a short leash. You can use the leash to keep things under control until the dog learns the rules. Establish some rules and expectations for your dog. Implement a policy of giving affection and treats by invitation, not on demand, and you’ll be on the right track. Remember to be patient and establish a balance. It may take a few months for your new dog to feel at home. Stick to a routine that includes affection, exercise, and discipline. Your patience will help your dog feel more at home. With their large ears and permanent smiles, French Bulldogs are adorable. They are lovable and playful family members that can provide 14 years of happiness for anyone lucky to have them as friends. If you’re interested in fostering one of these fantastic dogs, check out this link. The Best Pet Foods for Every Pet, Because They’re Worth It!